Geographic coordinate systems enable us to spatially locate features on the Earth using specified set of two dimensional numbers. The coordinates of each feature represent the horizontal position (and sometimes vertical position when elevation is available) of it and one of the most commonly used coordinates is Geographic with values of latitude, longitude. However many different coordinate systems can be used to map the same area depending on various factors such as map extent, scale, end user etc. Therefore we often find in Geomatics that we can have data from different coordinate systems that we need to use together spatially in one reference system. I am sure that most of us have run into times when we have features that have defined coordinates of one system that we need to use with a different one. (E.g. your map is in UTM (Universal Transverse Mercator) but you have been given GPS points in Lat/Long). In Canada most of our data sets are created in Geographic, UTM or MTM, although there are other coordinate systems (but these are the most common). 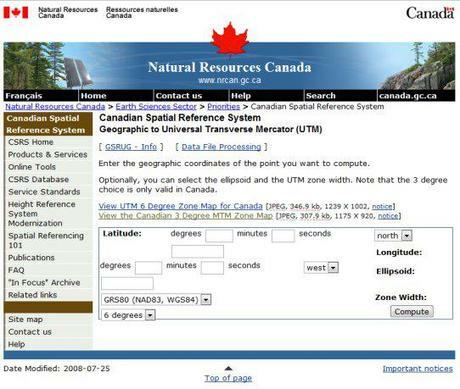 If you ever find yourself in need of quickly getting values converted from Geographic to UTM / MTM (Modified Traverse Mercator) or UTM / MTM to Geographic then I suggest a free online convertor tool that I often use provided by Canadian Spatial Reference System (Natural Resources Canada). The tool provides you with a simple input screen where you can enter your coordinate values with basic info about the coordinate system and then with the click of a button you get converted values in the system you are using. Something else I find common in Geomatics is that people will supply you coordinates in UTM or MTM and forget to let you know what zone it is located, so I often use these two Canadian reference maps that have the zones clearly defined on them as a quick guide. 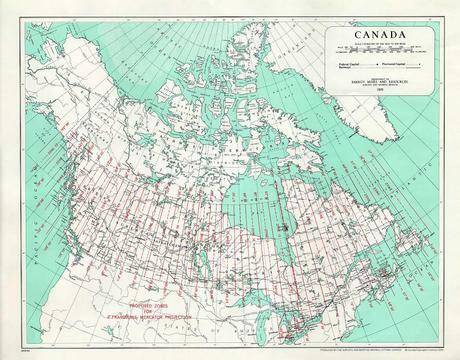 the links below will provide you with much larger Canadian reference maps like the one above. Now the Canadian Spatial Reference System tool isn’t the only way to convert coordinate values there are other utilities built into some software packages. (E.g. Google Earth allows you to change the input settings, letting you work with either UTM or LAT/LONG and ArcGIS also has a XY coordinate locator tool.